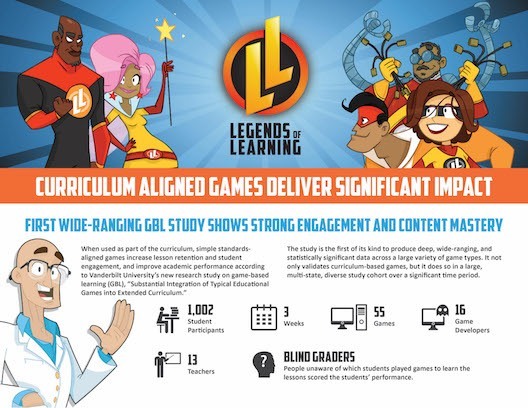 Did you know the Legends of Learning platform and games were base off an academic study? The largest study of its kind, Vanderbilt University’s “Substantial Integration of Typical Educational Games into Extended Curricula” found students boosted their test scores by the equivalent of over half a letter grade in three weeks when their teachers used digital games in the classroom. Published by Journal of the Learning Sciences, this research demonstrates the benefits of game-based learning for students. The research found students in the classes with the games outperformed their peers receiving traditional instruction on essay and multiple choice questions. Download the executive summary today!